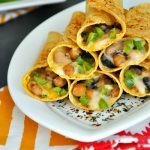 These easy baked flautas are loaded with beans, veggies, and melted cheeses and baked til cripsy perfection! Vegetarian and oh so tasty, these feisty flatuas use corn tortillas so they’re gloriously gluten-free. As you know, I’m a creature of habit. I’d undoubtedly have a zillion and one more recipes to share if I didn’t spend most of my days making the same recipes on repeat. Technically this is a huge no-no for a food blogger, but I adore everything I post. Besides, if I don’t serve it up on repeat, then it doesn’t belong on the blog. I’ve stuck to this mantra for years and while I may not be rolling in blog posts or belting out cookbooks, I have recipe quality on lockdown. These hot, melty, crispy, cheesy little rolls of amazing-mex are no exception. They’re a combination of two of my favorites from the P&C archives: Black Bean and Sweet Potato Flautas and Triple Bean Veggie Burgers. They got frisky in the kitchen and the results were out of this world incredible. I wish the photos did them justice. Beans are hopelessly awkward to photograph, but holy cow are these easy baked flautas are good! Singing and dancing in your kitchen with a flauta as your microphone kind of good. You’ll need to make a bunch, of course, because you’ll keep eating your microphone. 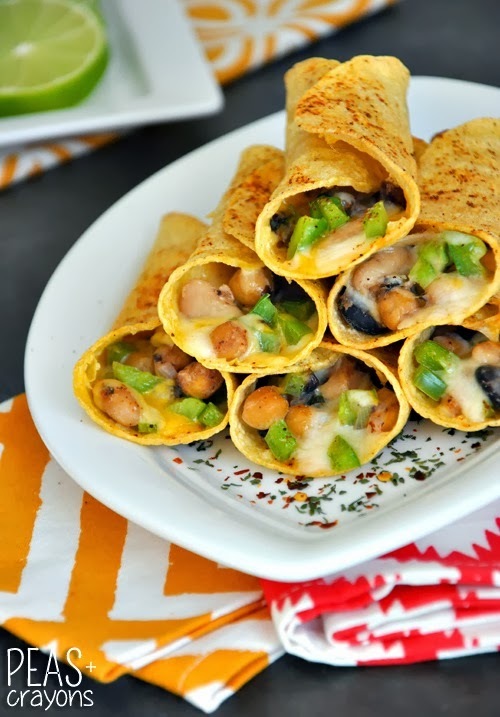 These easy baked flautas are loaded with beans, veggies, and melted cheeses and baked til cripsy perfection! Pre-heat your oven to 385 degrees F.
Saute your onion in a little bit of oil [approx 2 TBSP] to soften. Next combine bell pepper, beans, and salsa in a large bowl. Add onions to the mix and season with chili powder, garlic powder, cumin, cilantro, cayenne, oregano. Next wrap a small stack of corn tortillas [4-5] in a damp paper towel and microwave on high for 30 seconds. Follow it up with an additional 30 seconds. The goal here is to steam the tortillas so they roll into perfect flautas without breaking or cracking and this quick-steam trick works like a charm! I highly suggest to work in small batches of 4-5 tortillas so they stay warm while you're filling/rolling them. It's so much easier that way! Once steamed, spray or rub one side of the tortilla with oil and add a thin layer of veggie filling vertically along the center of the opposite [un-oiled] of the tortilla. Top it off with a layer of cheese [as much or as little as you want!] and gently roll the tortilla. tip: your steamed tortillas will naturally start to curl around each other in the stack. This is a total advantage since they naturally want to roll! When you unwrap your tortillas from the paper towel, oil the side facing up and then put the filling on the side that is curling inwards. Viola! Seal each flauta shut with two toothpicks and place on a wire baking/cooling rack. Repeat these steps until you have a rack full of flautas. Once you'e ready to bake, give them one more teeny spritz of oil and place the wire rack on on a foil-lined baking sheet. The wire rack elevates the flautas and allows them to get nice and crispy on both sides. Sprinkle the finished product with a dash of, garlic powder and cayenne pepper. Prefer to keep it mild? Simply the sub cayenne with paprika. Bake on the middle rack, at 385F, for approximately 15-18 minutes. At the very end, set oven to broil on HIGH for just under a minute to crisp the tortillas into a perfectly golden, crunchy shell. You can also flip the flautas at the halfway mark, this works especially well if you're not using a wire rack. You'll also want to pick up some toothpicks [they'll make achieving perfectly rolled flautas a breeze!] and a few limes to serve up with the flautas. They add a burst of flavor and double as a fun garnish too! note: this recipe makes a few heaping cups of yummy flauta filling; enough for 25-30 snack-sized flautas. If you're planning on making a meal out of them, feel free to use larger tortillas! 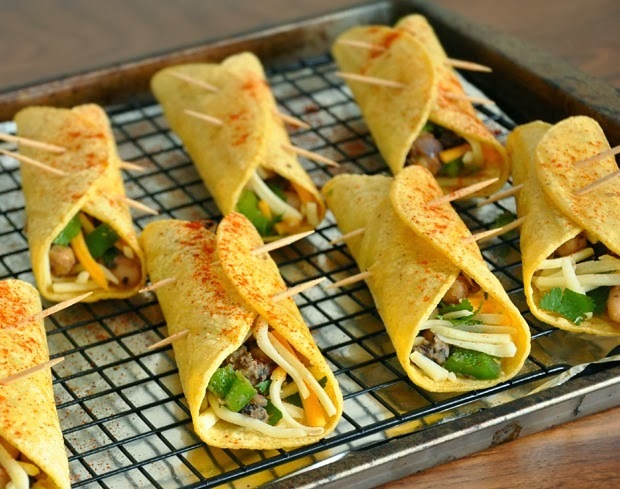 You can even freeze half for later [on it's own or after rolling it into heat-and-serve flautas for easy snacking!] or keep it in the fridge for up to four days to use in tacos, quesadillas, or anything your heart desires. It's sized to feed a crowd so feel free to halve the recipe if needed! I happen to eat like a linebacker and love having extras for lunch the following day! If you get a chance to try these easy baked flautas, let me know! Leave some love in the comment form below or tag your photos with @peasandcrayons on Instagram so I can happy dance over your creation. vegansaurus chefs skip the cheese or use your favorite soy cheese blend! spicysaurus chefs crave more heat? toss in some fresh or pickled jalapenos or simply dunk the flautas in the spiciest of salsas and feel the burn! note: the cayenne will control the spice-factor; adjust to taste. If you used canned beans, there’s usually enough salt in them to season your cooking. Either way, salt to taste based on personal preferences. I used a combination of canned and homemade beans so I added a pinch of salt to mine. You can also cook the peppers along with the onion if you’re not a fan of crunch raw veggies with hot/melty ingredients. I love the texture and bite it gives the dish but it also tastes amazing with the pepper sauteed. Simply follow your taste buds! They’re seriously a fiesta for your face! Delicious! I expected to like them since, after all, they were a hybrid of two of my favorites, but the amount of love I have for them is just plain insane. The yellow corn tortillas were a perfect pairing for the smorgasbord of flavors in these flautas. With hearty beans, tasty veggies and hot, melty cheese in attendance, your taste buds will be too busy partying to notice there isn’t any meat in these. Serve them up for Meatless Monday, Taco Tuesday, or any day of the week! and duh! — you will too! These zesty snacks are super flavorful all on their own, but feel free to dip them in your favorite sauce. You do have recipe quality on lockdown. For reals. I can say this because I’ve made a ton of your food, and I’ve loved every single thing. Plus you use real ingredients and you aren’t scared of cheese. You also love veggies so you’re pretty much my twin, without the look alike part. It’s a perfect faux-frying technique! Yum! These look super, super yummy! These are on my list for next week’s dinner plans! Wow, these look amazing and easy to customize. Can’t wait to try them! I tend to be a creature of habit too, going for a trusted easy recipe that’s great is much better after a long day sometimes! Thanks Catherine!! They would be perfect for Super Bowl Sunday! Yay!! Get your mex on! They’re little rolls of mexican amazingness! You’d love them! Make them and the SP nachos and have a full on fiesta! I’ve never even heard of flautas. I’ve been eyeing your sweet potato irisj nachos, but these are now looking incredible too!love easy, flavorful Mexican. And now I’m craving Mexican …. in particular, these beauties. Swoon!